School governing body (SGB) elections, which are South Africa’s biggest elections, second only to our national government elections, recently concluded at the end of March. Members, ranging from parents and teachers to school leaders and learners (in Grades 8-12), will serve on their school’s SGB for the next three years. Many newly elected members now find themselves having to engage with the South African schooling system on a deeper level in order to serve their term effectively. Although comprehensive training is provided by provincial Departments of Education, the complex terminology, legislation, policies, and regulations associated with school governance in South Africa can be precarious territory to navigate. Educational publisher Oxford University Press South Africa’s latest dictionary, the Oxford South African Dictionary of School Terminology, aims to demystify the landscape for the large number of people who interact with the South African schooling system, enabling them to think and act in an informed way. These may not necessarily be only SGB members, but educators, learners, public officials, civil society, academics, and even politicians. 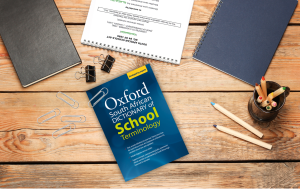 Compiled by Clive Roos and Michael Wilter, who have many years of experience engaging with the South African schooling framework, the Oxford South African Dictionary of School Terminology covers legislation, policies, regulations, and case law up to June 2017, making it the most up-to-date reference tool of its kind. The dictionary includes clear and comprehensive definitions for over 750 terms drawn from the South African Schools Act, Employment of Educators Act, and other laws and regulations that are relevant to the school system. These range from straightforward words such as curriculum and examination to more complex terms such as scheduled teaching time and quarterly return on learner attendance. Case studies are provided for 17 key legal actions, acknowledging the significant role that the courts have played in clarifying key schooling issues. These issues range from school language policies and learner pregnancy policies to the liability of the state for injuries sustained by educators during school times.